Outdoor point to multipoint wireless backhaul systems offer today's most flexible, economical, and easily deployed solutions for connecting multiple remote sites to the network. 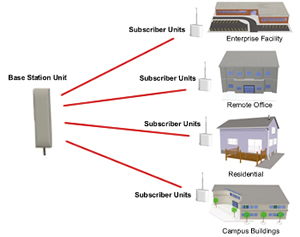 Point to multipoint wireless backhaul systems are ideal for interconnecting campus buildings, security systems, control systems, IP video surveillance cameras, WISP applications, integrating remote business sites, or installing last mile connections. Point to multipoint wireless Ethernet bridges are generally in the 900MHz, 2.4Ghz, and 5GHz ranges. These systems can provide DSL equivalent up to 170+ Mbps aggregate throughput. They are generally used where bandwidth requirements are generally lower and provide great DSL/T1 replacement. The range can extend as far as 10 miles, with optimum performance in the 1 to 2 mile range. Point to multipoint wireless backhaul systems are made up of a Base Station Unit (BSU or AP) that can communicate with multiple Subscriber Units (SU's). Many systems can handle over 100 plus SU's per BSU. In most cases the BSU's provide a sector antenna beam pattern (typical is 60 degree, with some systems allowing external antenna configurations for expanding to 90 and 120 degree sector antennas). Multiple BSU's can be installed to create a 360 degree sector (like a typical cell site configuration). Need more Information on Point to Multipoint Wireless Ethernet Bridges?